a full eight octaves, its expressiveness and superb playability set the standard by which other concert grand pianos are judged. 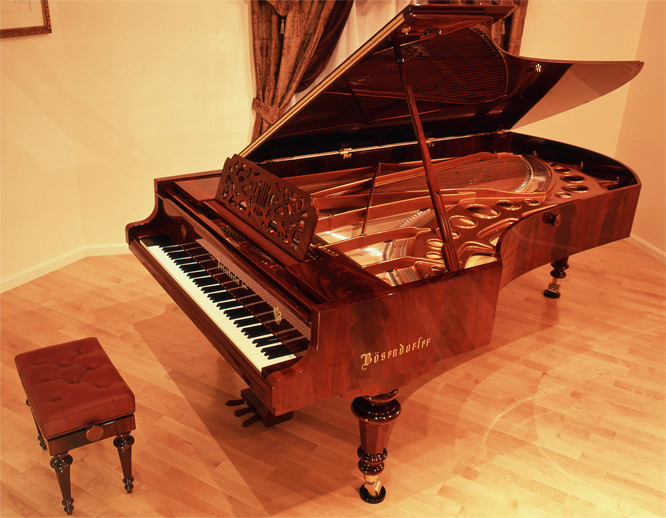 Above: Bösendorfer Imperial Piano S/N 44606 at home 20 October 2000. Bösendorfer for Strauss, Liszt and others in the 19th century. Click on the image to see enlarged view. You are listening to Rachmaninov's "Prelude No. 2 in C Sharp Minor" Op. 3, recorded on this piano by pianist Sidney Yin. Contents © 2000-2013 M. Cohen and respective contributors, All Rights Reserved.